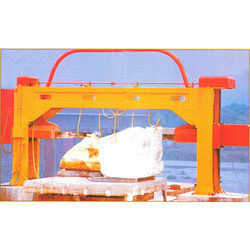 Block Dressing machine is used for resizing the block into required dimensions. This machine saves the cost of production and labour. - Length of Blade 4200 M.M. - Stroke of Saw Blade 400 M.M. Main Electric Motor: 30 H.P. Lifting Motor Fast Speed: 3 H.P. BLOCK DRESSING MACHINE is best suited for marble block dressing Marble block Dressing machine with Trolley, Rail Having maximum cutting size Length of 10’ and Height 6’ Complete unit with Electricals. R/F Motor – 2 H.P. Being a leader in the industry, we are engaged in manufacturing and supplying a qualitative range of Mono Blade Block Dressing Machine. Uses: Used in various industrial sectors for cutting diamond block. Our company is widely praised in manufacturing and supplying a range of Diamond Wire Block Dressing Machine. Our offered machine is extensively used in various industrial sectors. These machines are manufactured by our professionals using quality assured material keeping in mind international set norms. Apart from this, our dear clients can acquire these machines from us at affordable prices. Feed Motor Slow Speed: 1 H.P. This is an equipment used for feathering birds after slaughter. The use of a dressing machine makes chicken dressing easier, clean and hygienic.